The perfect blend of creamy, smooth peanut butter goodness, with the salty crunch of yummy whole peanuts. Super easy. And with only 4 ingredients. Be warned. Addiction risk high. Line a slice tin with baking paper and chop butter into cubes. Melt the butter and rice malt syrup in a small saucepan over medium heat, stirring occasionally. Add the peanut butter and keep stirring until all the ingredients are well combined. If the mixture starts to bubble remove from heat and turn the cook top down a fraction. Once the mixture has cooled, return it to heat and continue stirring.. Remove from heat and stir through the salted peanuts. Pour the fudge into lined tin. Transfer to the freezer and freeze for at least an hour or until firm. 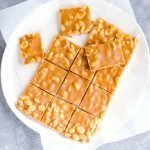 Cut into 14 squares and enjoy the yum!